To counter the success of the Hyundai i10, Maruti has launched its latest model, the Maruti A-Star which is also supposed to be a competition to the Hyundai i20. Similar to the i20, the A-Star is a five seater, five door hatchback car and has been manufactured keeping in mind the international standards. Though the A-Star has replaced the other Maruti model, Alto in other countries, in India the two models will be sold side by side. The front of the Maruti A-Star has a low slung grille and its headlamps are flame shaped, extending from the bonnet to the bumper. The A-Star has a bulged out appearance due to its vertical A-pillar and inverted C-pillar. Due to the car’s butterflying design from outside, its rear has small windows and also less leg room for taller people. The A-Star is quiet a comfortable car for driving with it’s easy to read big instrument cluster and meters. It also has its first of a kind dash mounted tachometer. A drawback is the car’s dashboard, which a bit on the higher side may obstruct the view of short drivers. The wheelbase of Maruti A-Star is 2360 mm and it is powered by 1.0 L and 1.2 L engines. The 1.0 L engine has a 3 cylinder, 12 valve unit which produces a power output of 48 kw or 65 hp. The new ‘KB’ series 998 cc engine has been used in the car. This engine will run greater distance for a litre. 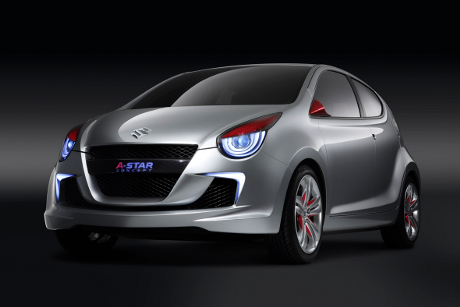 The A-Star’s 1.2L engine has a four cylinder, 16 valve unit which produces a power of 63 kw or 86hp. Both the 1.0L and 1.2L engines are Euro 5-compliant with an emission of carbon dioxide. These engines have low friction and flat torque delivery at lower to mid range speeds. This enhances the car’s drivability and gives higher fuel efficiency. Maruti has launched 3 variants of the Maruti A-Star which are the Lxi, Vxi and Zxi. The highest model that is the Zxi has many key features like power windows and power steering, remote central locking, Dash mounted tachometer, remote boot and fuel filter, rear defogger with wiper and washer. The car has CD player with 4 speakers. For safety and security this model has driver and passenger Air bag, Anti Lock Breaking System (ABS) and Electronic Brake Distribution(EBD). All the variants of the Maruti A-Star have body coloured bumpers, mirrors and roof mounted fog lamps and stop lamp. The seats and door of the A-Star are fabric lined. On the whole the Maruti A-Star is stylish with its sporty and youthful look. It has an easy urban mobility. Though the car is light due to downsizing, its interiors are quite roomy and comfortable. The Maruti A-Star has launched with 9 different shades which are the Arctic White, Desert Brown, Azure Grey, Paradise Blue, Healing Green, Sunlight Copper, Bright Red, Silky Silver and Midnight Black. Let’s go with comfy Alto!